I am a fulltime IT project manager by day. 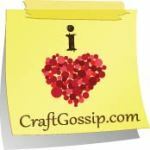 Outside of work, I am very into my craft room, my etsy shop Prized Possessions, beading and other crafts. Get the My Twitter Updates widget and many other great free widgets at Widgetbox! Happy New Year! Today I completed my first craft project of the year so I thought I would share it with you. It will also be my first blog post of the year…hopefully I’ll get a little better at keeping up with my blog posts in 2012! The end of 2011 just got a little too busy for me! Today was my New Year’s holiday from work, so after going to the fitness center, then out to lunch with my husband and son, I decided it was time to dig in and get started on a project, one that has been on my list for a while. My husband and I participated in a photo walk in Kansas City last summer. Every participant could enter one photo taken on the walk and taken in a certain area of town in a photo contest. My husband’s photo won third place! 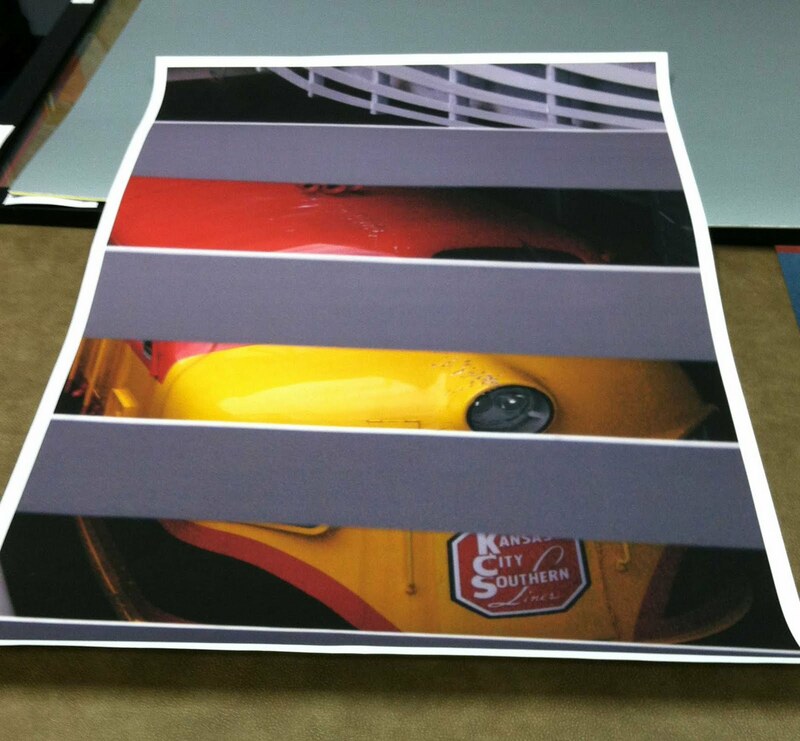 He got a poster sized print of his photo and it was on display at a local bank for one month. I told him I would mat and frame his picture for him as one of his Christmas presents. So today was the day to do that. He took this photo of a train though some boards on a pedestrian bridge by Kansas City’s Union Station. Here is his wining photo. 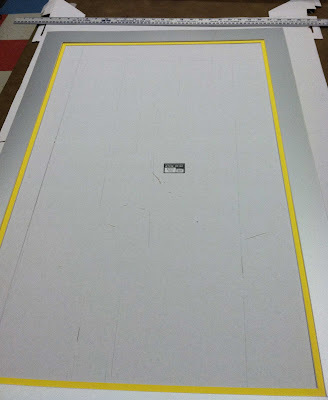 A few years ago, I bought a mat cutter, which is very easy to use. It’s MUCH less expensive to mat and frame my own pictures rather than paying the high prices to have something framed. First I cut my two pieces of mat board to 24X36 inches to fit inside my frame. (And I checked – they really did fit just right inside my frame.) My mat cutter came with a separate mat knife which I used to cut the boards down to the right size. Then on the back side, I measured and marked a 2-inch wide border on the gray board and a 2 3/8-inch wide border on the yellow board. Now it was time to cut out the opening of each. My mat cutter is made up of two pieces, a piece that looks a lot like a paper cutter that holds the mat board in place and a separate angled blade. (See this post for how it works.) I haven’t used my mat cutter in a while. 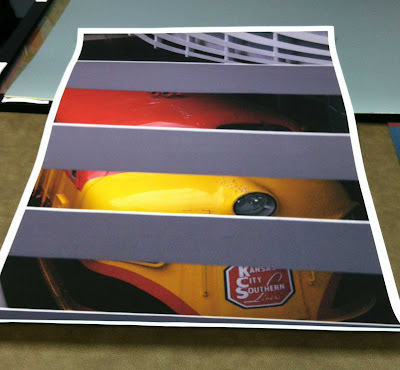 I had forgotten that it could only hold up to a 23-inch piece of mat board. It’s probably a good thing I forgot this, otherwise I may have not undertaken this project! 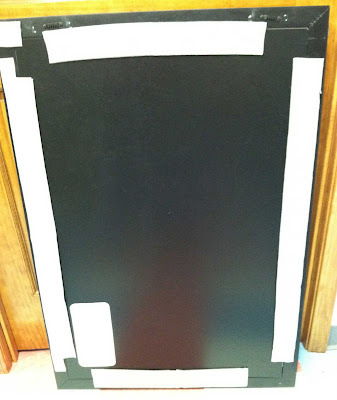 Since my mats were 24X36 inches, I could not use the piece that holds the mat in place. I recruited my husband to help me hold a metal yard stick in place to use as my cutting guide. It turned out just fine. Here is a picture of my gray mat with the center piece cut out and a picture of the two mats layered on top of each other. So I put it all together, using some scrapbooking acid-free mounting squares to stick the three layers together, the two mat layers and the photo. 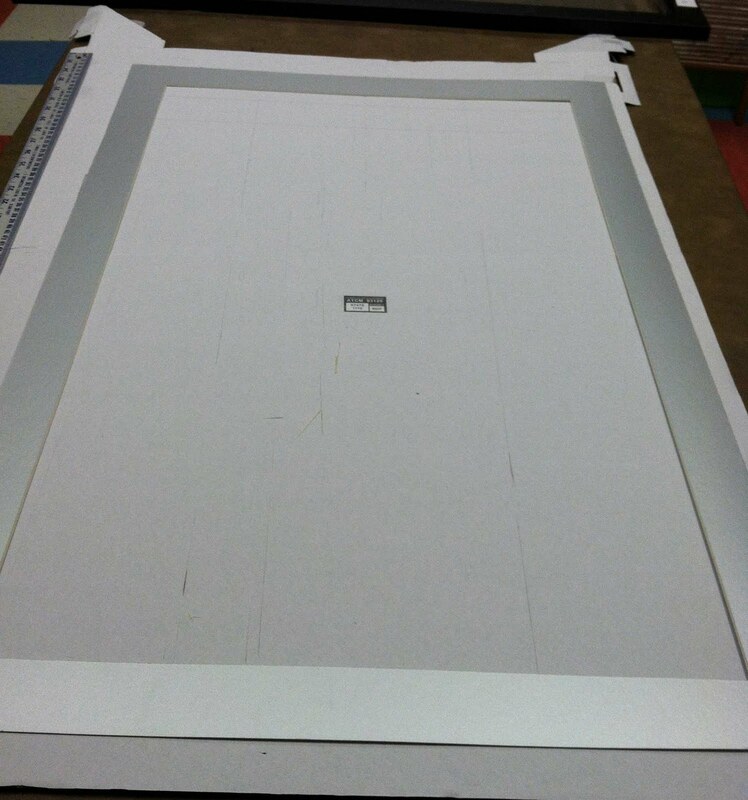 I put it all in the frame and discovered that the frame was not deep enough to hold two layers of mat board. The little metal things that hold the back on the frame when you turn them into the little slot did not go into the slot since the mats were too thick. We had some of those glaziers points that are used to hold window panes into a frame (left from a Halloween project). I could not push them into the sides of the frame, so my husband put those in for me. Now I had these metal glazier points and the metal things on the frame that were all just waiting to scratch up my nicely painted basement wall, which is where the picture is going to be hung. I had some gray felt from which I cut strips long enough to cover the dangerous parts. I used foam scrapbooking mounting squares to adhere the felt to the back of the frame. Here is what the back of the frame looks like. 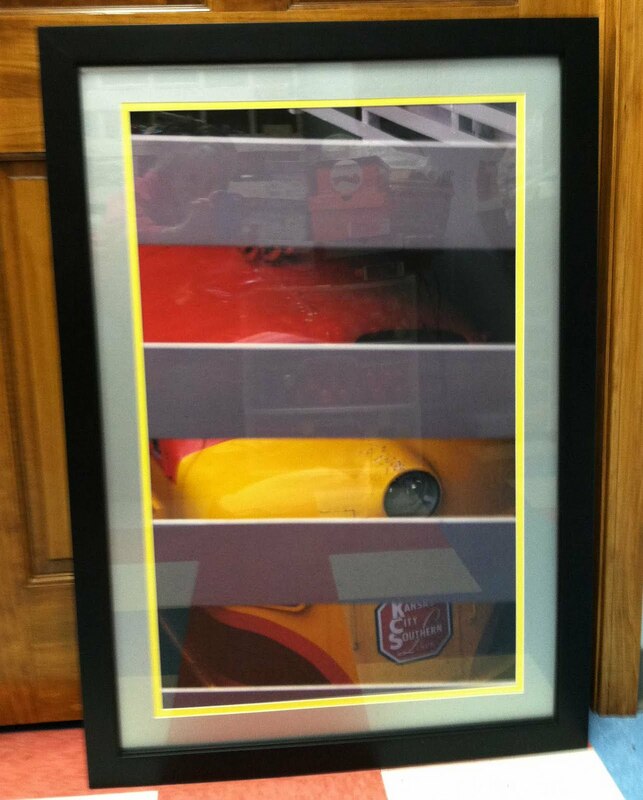 And…ta da…here is my finished matted and framed picture! I was pleased with how it turned out! Hopefully we’ll get it up on the basement wall very soon. OK…Better late than never! I'm a little late for November, but it is still barely November! 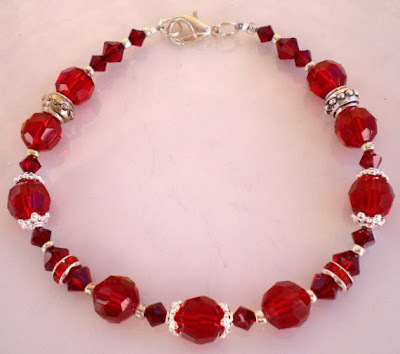 The featured EtsyBlogger for November is MagdaleneJewels. She has two Etsy shops and also a couple blogs – not sure how she keeps up with all that! But please take a look at all her lovely items for sale and her interesting blogs. Etsy shop. I love this beautiful bracelet! What a lovely addition to any outfit this would make for the holidays! 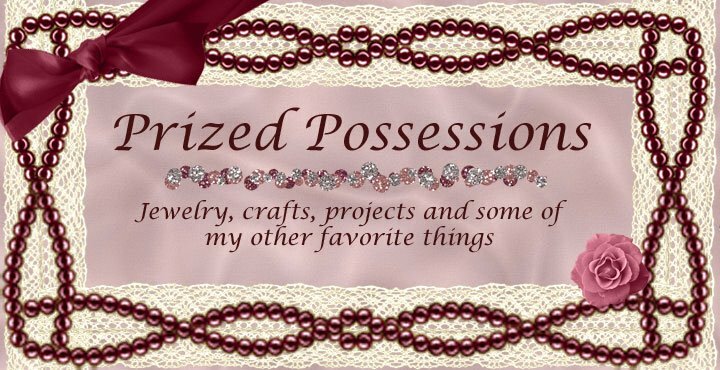 In her Magdalene Jewels blog, she showcases many of her fellow EtsyBloggers in treasuries she has created. A very pretty blog to look at. And interesting to read about other EtsyBloggers. everyday life, including many pretty Wordless Wednesday photos. I don’t know how she can keep up two blogs and two Etsy shops! She’s a busy lady! 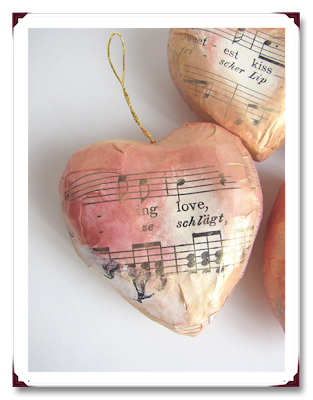 Please take a look at all the lovely items in both her Etsy shops and at her blogs, too! 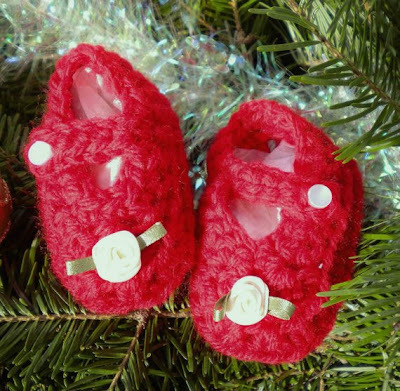 Congratulations to MagdaleneJewels, the November EtsyBlogger! What are your plans for Halloween? Have you made anything in your shop with Halloween colors/theme? Show it to us. I must say that although I had ideas for Halloween items for my shop, I did not make anything for Halloween this year. But I did have plans for Halloween this year, as well as the previous two years. 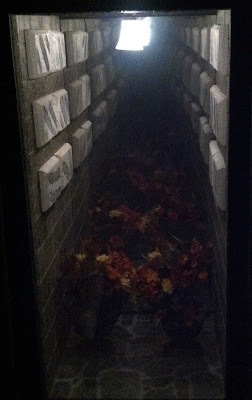 I hosted my third annual Halloween party on Saturday. My life usually becomes consumed with Halloween for the months of September and October. I would love to get to the point where I was preparing for Halloween throughout the year instead of fitting it all into two months, but I am not quite there yet. This year, we had a haunted wedding reception. I had costumes, decorations and food to make. It was a fun theme because I could start with a normal party idea (i.e. wedding reception) and make it kind of creepy. Our guests really seemed to get into the theme and most came dressed for the occasion since I suggested that appropriate wedding attire (i.e. costumes) was recommended but not mandatory and that there would be a prize going to the best dressed and creepiest guests. My colors for the party were black, silver or gray, and blood red. I started with normal wedding things and changed the colors to fit the theme. 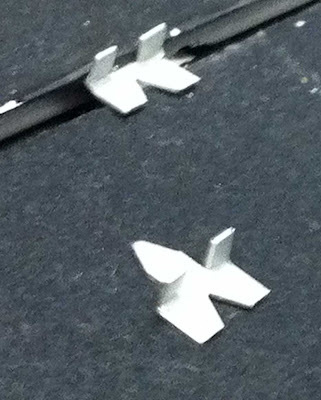 For example, I got some of those honeycomb white paper bells and spray painted some black on them to make them fit in. My costume (the bride) was silver and dark red, trimmed in black. 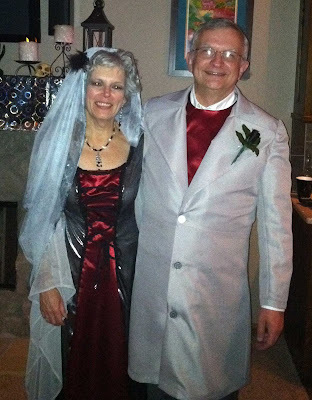 My husband’s costume (the groom) was gray and dark red. Here is a picture of us in our costumes. I made a new wreath for the party. 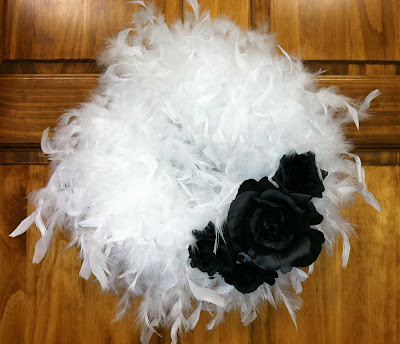 It was white marabou accented with black flowers. And I made my first tiered cake. Between Martha Stewart’s web site and CakeCentral.com, I found lots of great photos and recipes. 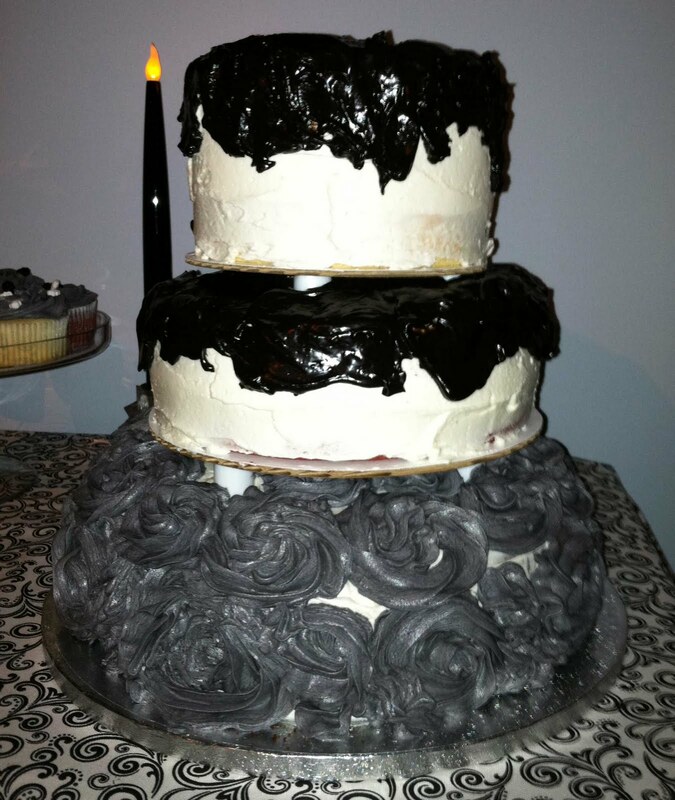 My cake had a bottom layer of chocolate, middle of red velvet and the top layer was a delicious white velvet recipe. My husband decided to build this endless mausoleum after seeing it in one of my How to Haunt your House books. It turned out great! It’s in our dining room and it’s too bad it can’t stay on display for a longer time of the year because it is really cool! So those were my Halloween plans. I’ll try to do a post on my flying bats (one of my favorite new decorations) soon. What did YOU do for Halloween? I’d love to hear! How to briefly summarize the three and a half months since my blogging took a break? I thought my summer would have been a little calmer since I was not travelling to baseball games this summer (they were all local), but life just got very busy. 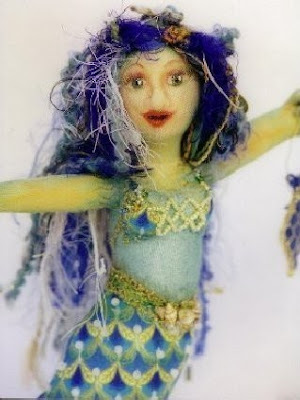 I did show you what I made in the classes I took at the Bead & Button show in June. Then in July, my mom and I had a long weekend in Dallas to go to the every-three-year family reunion. That’s always fun. When I got back from that, it was time to figure out a family vacation (nothing like waiting till the last minute) in early August. We had to fit it in between the end of baseball season in late July and the start of school in late August. My husband was managing a project in Scotland and needed to take a couple trips over there. He was unsure of the exact timing of the trips, but then we realized we could plan a family vacation in conjunction with his second trip. So we spent 10 wonderful days in Scotland in early August. I LOVED it, in spite of the fact that I had to wear my waterproof jacket almost every day I was there. It never rained really hard. But you could hardly call it dry. We stayed in Troon (across the road from the Royal Trool Golf Course), about 27 miles from Glasgow, as the first part of our trip. This was where my husband had to work for three days. 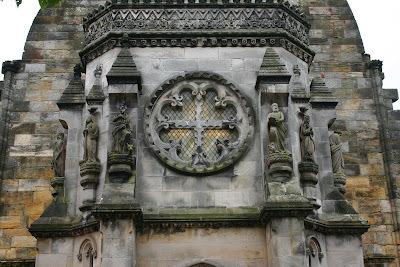 So our son Joe and I went sightseeing in Glasgow those three days. To get to Glasgow, I drove those 27 miles there and back in our Ford diesel rental car on the left side of the road. That was kind of scary at first but kind of fun toward the end. We bought a ticket on a sightseeing bus that let us get on and off at stops all around town for two days. Those were the only two totally sunny days we had, so it was perfect for riding on the top of the open air double decker bus. We saw churches, museums, bagpipers, botanic gardens…all sorts of wonderful sights. Then we had three days in Edinburgh. Lots of castles, ruins of abbeys and palaces, the Royal Yacht Britannia (the royal family’s retired yacht), Rosslyn Chapel where part of the DaVinci Code was filmed (I had to check it out from the library and watch it after we got home). 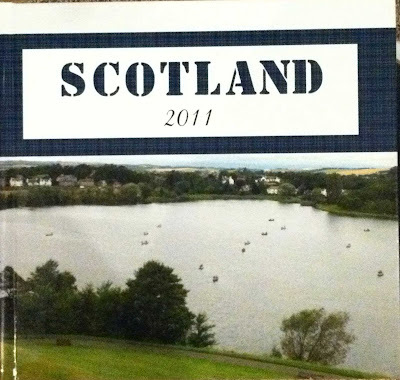 The last part of our stay was in Inverness in the Scottish Highlands. We stayed across the street from an arm of water, very quaint and scenic. We took a boat ride on Loch Ness, learned some history of the Loch Ness monster at the Loch Ness Centre, had a tour of a Scotch distillery, saw how tartan plaid fabric is woven, saw more ruins and castles. It was all just wonderful! 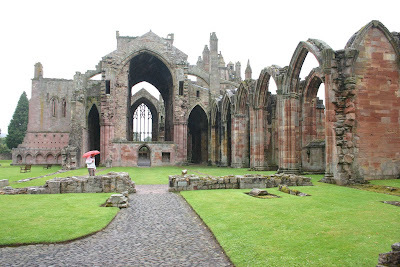 Here are some photos of my two favorite things – the Rosslyn Chapel and the Melrose Abbey ruins. I loved all the ruins. It was fascinating to think these structures were built hundreds of years ago and such huge pieces are still standing. I’ve been very inconsistent about doing scrap books or photo albums after vacations, but we came home with so many wonderful photos, I didn’t want to NOT do an album. I decided to make an online photo book from Winkflash. They had a special where I could get up to a 100-page album for the price of a 20-page album. I furiously worked to finish my 94-page 12X12 album before the coupon expired, sometime staying up until 1 or 2 in the morning. I placed my order right before the deadline, only to find the next day they extended the offer another week. But I was glad the book was done. I did find a few typos in it, which I wasn’t terribly pleased with, but considering how much work I did after midnight, I’m surprised there weren’t more! I received my book in just a few days and I still love looking at it! Less than week after we got home, it was time for Joe to head back to school. Helping him get ready to go and get packed kept us busy. He drove himself to school with a jam-packed car and we did not even go along with him this year. And there was no fall baseball game this year so I haven’t seen him since he left in late August! Before we left for Scotland, we started making plans to get our deck rebuilt since it was about to fall apart. We enlarged the existing deck and added a lower level deck below it. That construction was going on while we were away. It was all finished by Labor Day, when we went shopping for new patio furniture (fortunately it was all on sale)! And then, of course, it was time to start planning for Halloween. I have been busy with that for the last several weeks, making costumes, planning decorations, etc. I love Halloween- it’s so much fun! But now I’m ready to get back into blogging. Not that I have any more spare time, I’ve just decided I’m ready to get back to it. So there you have my last three and a half months. Whew! It went by quickly! But I’ll keep up with the next three and a half months better in my blog. It’s good to be back! 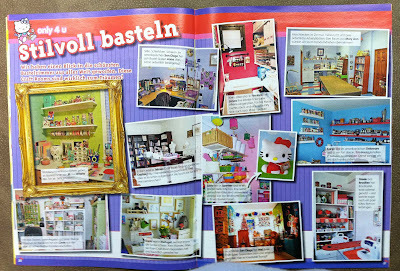 My Craft Room is in a Magazine Article! I’ve been in blogger retirement for too long. Time to change that. And today is a great day to change it. 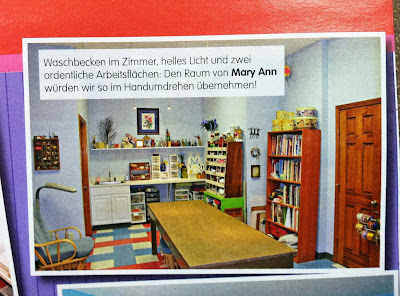 I’m very excited…My craft room was part of a magazine article! Of course, it’s a German magazine and I can only come close to knowing what it says using Google translator. But that’s just a small detail. 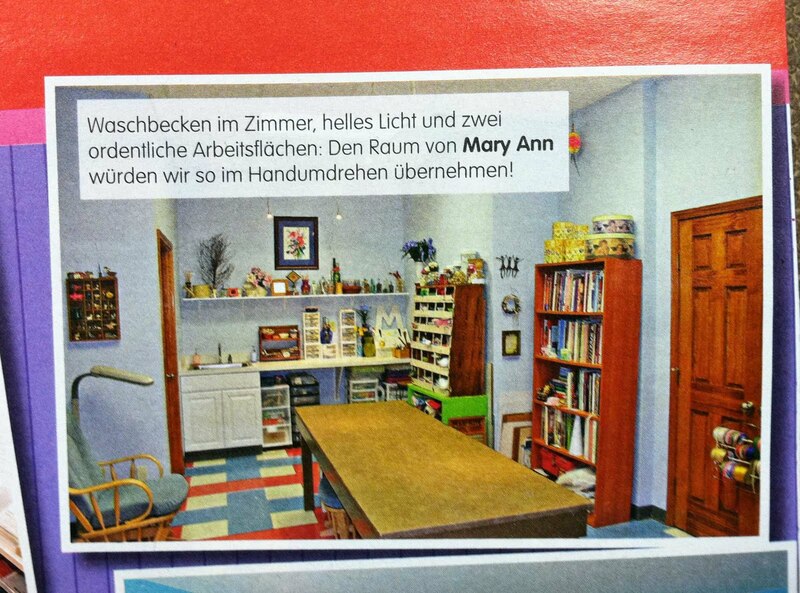 It’s still pretty exciting to see a photo of my room in print! When my craft room was newly built, I posted some photos of it on Flickr. I don’t use Flickr too much anymore but this summer I added some photos. I discovered a message which fortunately was not very old. 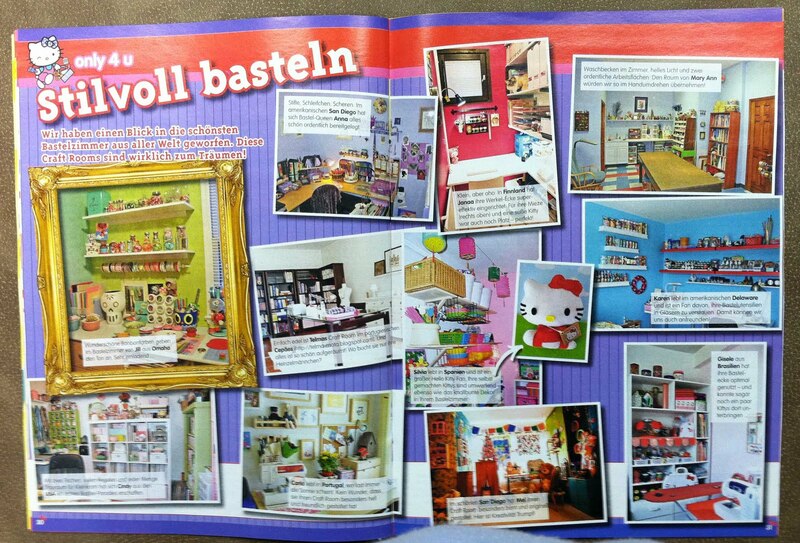 It was from someone working on an article for the German Hello Kitty magazine. They were going to show photos of craft rooms and she found mine on Flickr. I wasn’t positive that mine would be used, but she took my address and said she would send me a copy of the magazine in October. Well, today my magazine arrived and there was my craft room! That really made my day. Probably my entire week! Here’s a picture of the two-page spread. And here’s a close-up of my craft room, the photo in the upper right corner. And tomorrow I will get back into blogging. I’ll give a brief update on what I’ve been doing for the last three and a half months. I can’t believe it’s been that long. But I’m back now. Talk to you tomorrow. The EtsyBlogger featured for June is Tammy. Her Etsy shop is http://www.tamdoll.etsy.com/ - Tamdoll SILVER Mountain Originals. She sells wearable art and unique accessories. Here are a couple of my favorites from her shop. 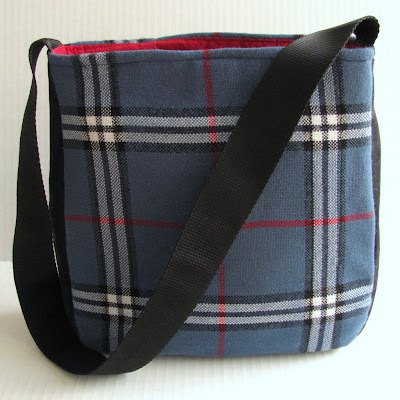 Being into recycling/upcycling as I am, I love Tammy’s “Don’t Be Blue Trendy Plaid Handbag.” It’s an upcycled wool scarf! What a great idea! And look at this cute mermaid pattern! What fun it would be to make a bunch of these! I think they’re adorable. Tammy’s blog is tamdoll.blogspot.com. I love it! It’s full of all kinds of crafty info. Lots of tutorials and other instructions and just some great ideas. I had a hard time getting back to writing this blog post because I got all caught up in some of Tammy’s blog posts. Here are a couple that caught my attention. 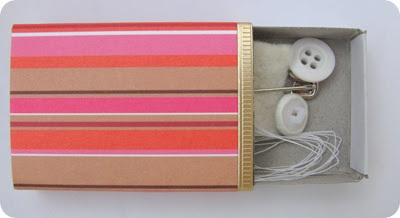 And these cute ideas for decorated match boxes. I love them! They’re so clever! I’m sure you’ll find tons of other ideas that will grab your interest on her blog since Tammy enjoys sewing, knitting, crocheting and many other types of crafting. 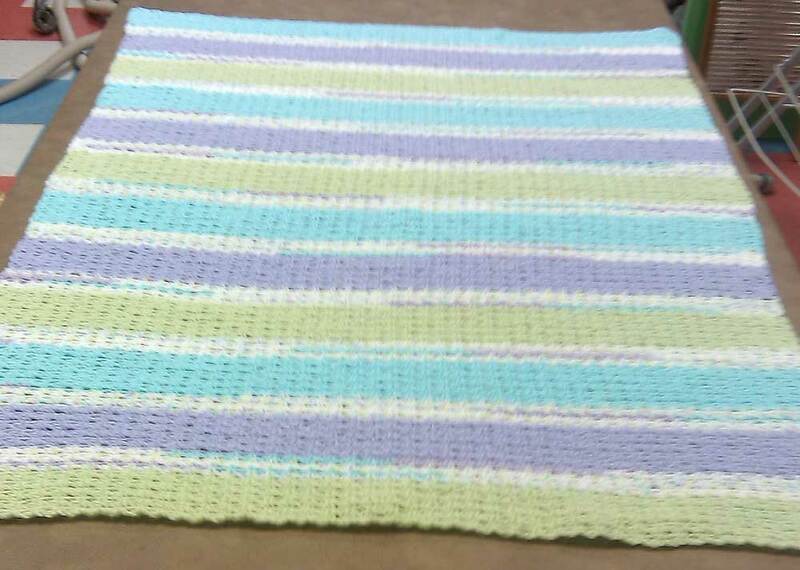 Before I went out of town, I finished my crocheted baby afghan and got it sent off to the the new parents. I had some yarn left over and this was a fun and easy pattern to crochet so I bought the additional yarn I needed and decided to make a second one in the same colors. I could work on it while on my trip and have a baby gift on hand for the next time I need one. My earlier post showed some beginning photos of the afghan, along with a link to the free pattern online. 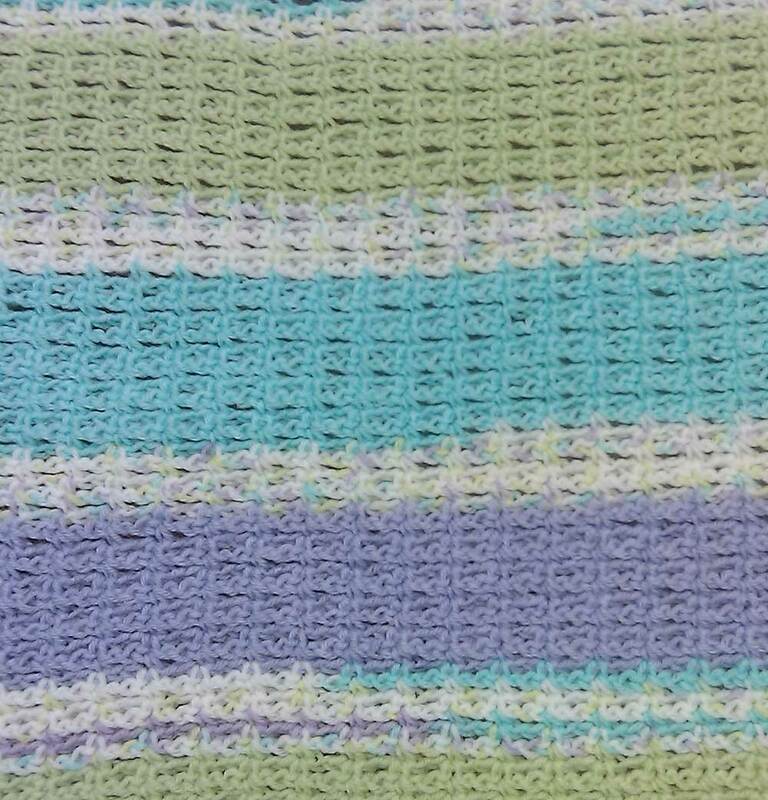 Here are photos of my finished afghan. When I first finished the crocheting, I liked the way it looked and wondered if I really wanted or needed to weave in the additional yarn and make the tassels. But what I had was pretty stretchy and didn't hold its shape at all. And here's what it looked like up close. 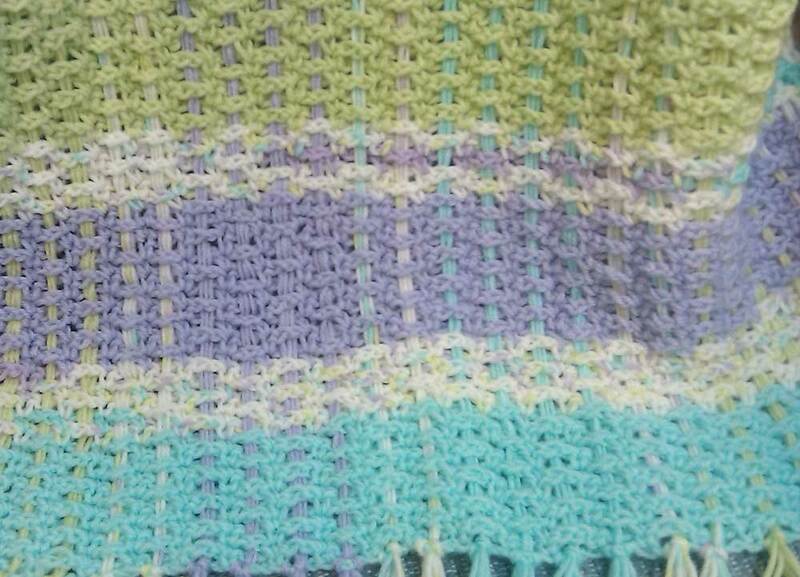 So I decided to go ahead with the weaving and do it like the pattern. Besides, I had plenty of yarn left anyway so I figured I might as well use it. You weave three strands of yard in and out between the rows. The ends of the yarn become part of the tassels. The instructions were rather unclear but I finally figured out what they wanted me to do. Here's what it looked like after I began the weaving. 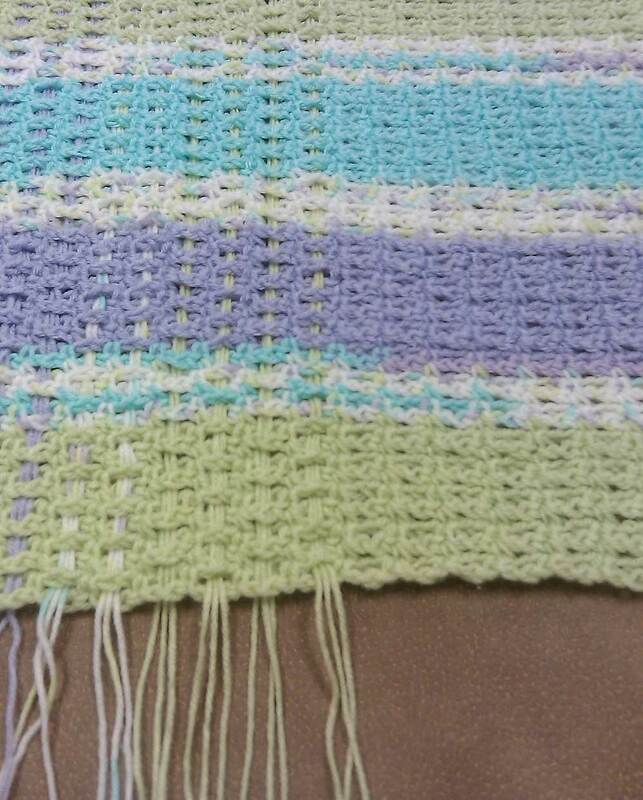 I used a big eye needle and did my weaving using that. 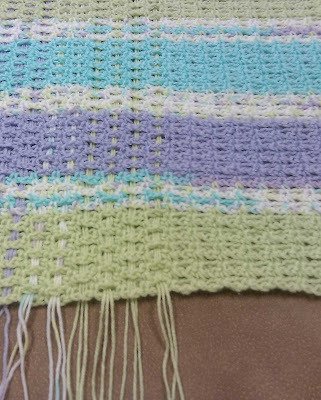 I was glad I went ahead and did the weaving. 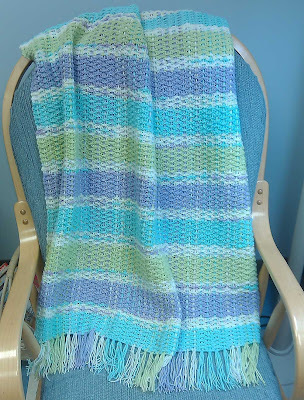 I did like the way the finished afghan looked much better after the strands of yarn were woven in. 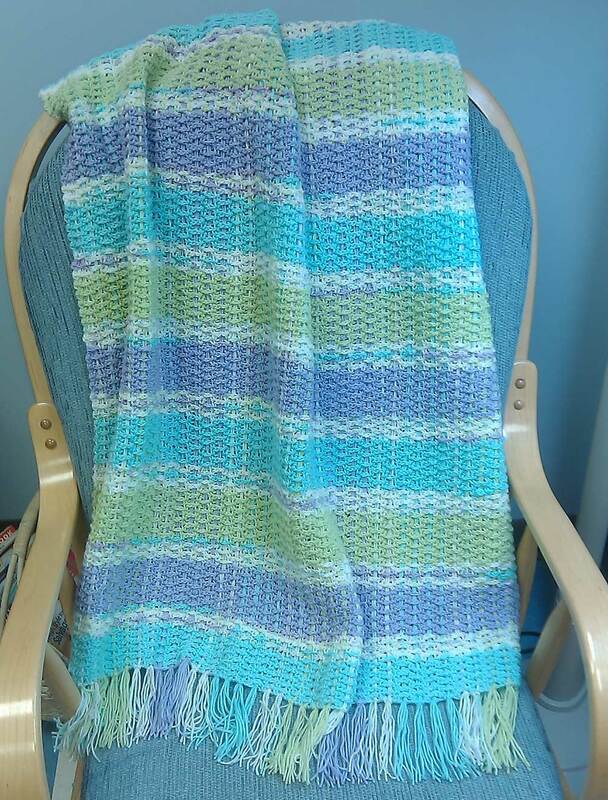 And here is the finished afghan. 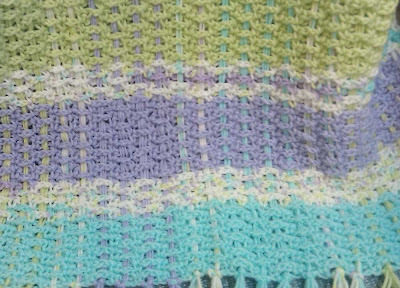 I got quite a bit finished on afghan number 2 while away. 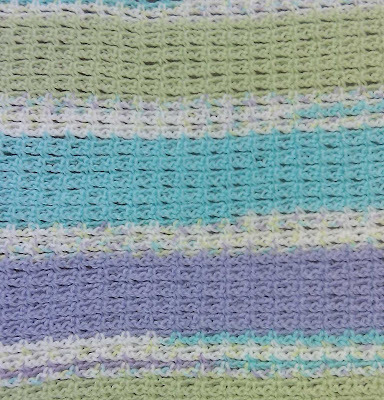 I finished four of the solid color stripes (10 rows each) and just started on my fifth solid color wide stripe. And I haven't crocheted a stitch since I've been home. So much to do, so little time...But I will get it done eventually!